Why did Europe experience industrialisation and modern economic growth before China, India or Japan? This is one of the most fundamental questions in Economic History and one that has provoked intense debate. 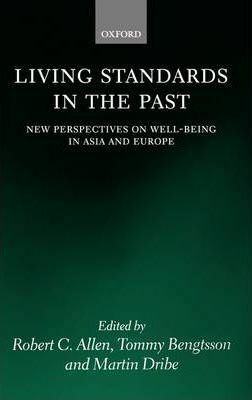 The main concern of this book is to determine when the gap in living standards between the East and the West emerged. The established view, dating back to Adam Smith, is that the gap emerged long before the Industrial Revolution, perhaps thousands of years ago. proposes an answer by considering evidence of three sorts. The first is economic, focusing on income, food production, wages, and prices. The second is demographic, comparing heights, life expectancy and other demographic indicators. The third combines the economic and demographic by investigating the demographic vulnerability to short-term economic stress. differences when assessing the level of well-being in the past. Academy and the Royal Society of Canada. Tommy Bengtsson, Professor of Demography and Economic History at Lund University, works in both historical and contemporary economic demography. He has served in leading positions in Swedish and international organisations and is currently Chair of the IUSSP Committee on Historical Demography and Series Co-editor of the Eurasian Population and Family History Series. Martin Dribe is Associate Professor of Economic History at Lund University.